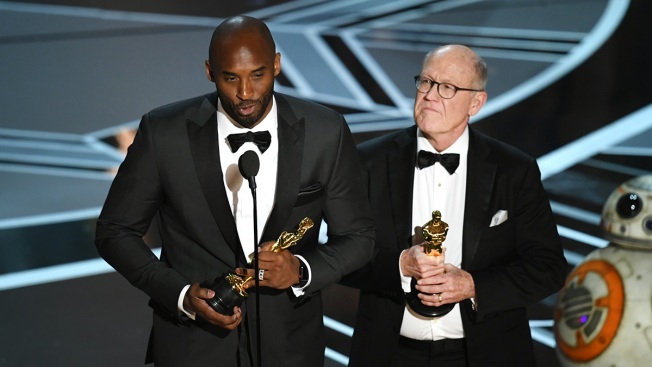 Filmmakers Kobe Bryant (L) and Glen Keane accept Best Animated Short Film for 'Dear Basketball' onstage during the 90th Annual Academy Awards at the Dolby Theatre at Hollywood & Highland Center on March 4, 2018 in Hollywood, California. Lakers legend Kobe Bryant won an Oscar Sunday night for best animated short film for his "Dear Basketball." The short was based on a poem Bryant wrote when he announced his retirement from the game. He was recognized alongside animator Glen Keane. Keane thanked Bryant during his part of the acceptance speech, saying "It's a message for all of us. Whatever form your dream may take, through passion and perserverance, that impossible is possible." Bryant jokingly replied "Well, I don't know if it's possible, I mean as basketball players we're really supposed to shut up and dribble, but I'm glad we're doing a bit more than that. Backstage after the win, Bryant told reporters, "I feel better than winning a championship, to be honest with you. I swear I do." Bryant was quickly congratulated on Twitter by the Lakers and the team's president of basketball operations, fellow Lakers great Magic Johnson. Some Twitter users expressed criticism of his Oscar win, however, saying it goes against the award show's focus on the Me Too and Times Up movements. we gonna be all time's up / me too and give kobe an oscar? Since the Me Too movement is so huge right now and one of the themes of the Oscars, doesn’t Kobe winning kind of make it a little awkward? It seems people have completely forgotten what he was accused of. Me too movement a big fan of Kobe Bryant huh? The basketball star was accused of sexually assaulting a 19-year-old Colorado woman in 2003, but the case was dropped when the woman decided not to testify against him. People reported the case settled out of court. Bryant had denied any assault but admitted to cheating on his wife.